Recently I documented my early yet harrowing return to No Man’s Sky, but ultimately came away realizing I wasn’t far enough into the game to formulate any real opinions on the experience as a whole. Just as I was when it initially launched, I was overwhelmed and ill-prepared for the latest chapter in my space chronicles. Beset by barren planets, space cops, and hostile environments, I was just about ready to accept that No Man’s Sky was just not the game for me. That was until I met The Space Billionaire. After the debacle that was my first attempt at exploring the universe, I decided to re-roll my character and get a fresh set of planets to explore. I still started off on a planet that hated me, but this one was a little bit more forgiving than the toxic wasteland that I initially started on. Luckily I spawned in right next to an outpost, which meant I’d be able to find a reprieve from the sweltering heat outside. As I set off to go find and repair my spaceship I received the notification that a player was joining my game. This mystery player landed their ship right in front of me and I was fully prepared for them to try to blast me into smithereens repeatedly until I quit the game. Once they exited their ship, we stared at each other for a few seconds before I decided to play nice and wave to them. They waved back. I gave a thumbs up and headed over to the clearing where my broken-down ship was sitting. I’d survived the first contact. At my ship, I went into my inventory to begin crafting the necessary components that would allow me to get off of this boiling planet and hopefully find one more welcoming. That’s when the stranger’s ship touched down next to me again, followed by four more. I genuinely thought this was going to be it for me, but I maintained my composure and went back to my inventory to craft more components. But there was a problem. 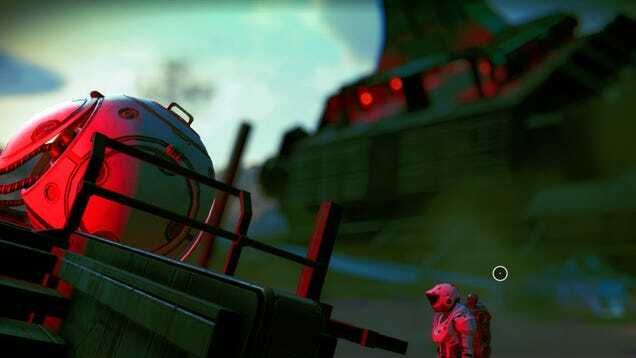 My inventory was filled with canisters of freighter fuel. Every available slot was packed with this mysterious item that I had absolutely no use for. The stranger then said to me, “you should sell those, they’re worth a lot of money.” It was then I learned that text chat was a thing and responded with the appropriate amount of gratitude for the gifts they’d bestowed upon me. “You should be able to buy a good class-A starship with that. Go and sell that stuff as soon as you can, and try not to die.” And just like that, they took off into the stars and vanished out of sight, and out of my game. So there I was, a man with a busted ship and potentially millions of space-bucks to my name, slowly dying of heat exhaustion on this unexplored planet. I had no space in my inventory to craft anything that would help me survive, I just had tons of fuel for ships I didn’t own. I needed to get back to that outpost quickly and offload this stuff, not only for profit, but to literally save my life. I arrived at the outpost, ready to begin my life as Rich Spaceman, the richest guy in this particular universe. That would’ve been the case were there actually a terminal for me to sell things at in this particular outpost. I had so much potential profit in my pockets, but no way to sell any of it. It was then I remembered that my ship had plenty of inventory space to put some of this stuff in, so I ran back to it only to discover that those were filled up too. These benevolent gifts were going to be the end of me. But lo and behold, I had one space that wasn’t filled with fuel, but rather 2 pieces of salt that I’d picked up at some point. I obliterated that salt as quickly as possible, opening up a precious inventory slot that would allow me to craft the necessary components to escape this Twilight Zone-esque hell I was living in. With my ship repaired, I set off to the nearest space station to collect my not-at-all-hard-earned cash. Now flush with way too much money, I made my way to the nearest planet which happened to be really darn nice. A lush landscape, overflowing with resources and devoid of any space cops. A place where the temperature is perfect 75 degrees all the time except for when the occasional boiling rainstorm comes through. This was the first time that I was able to really connect with No Man’s Sky and feel like I had some space to breathe and work at my own pace. I haven’t actually spent any of my newfound millions yet and probably wont until I absolutely have to, but I’m more than grateful to The Space Billionaire and their philanthropy. Their generosity coupled with the luck of finding a peaceful planet so early have made me very excited to explore more of what No Man’s Sky has to offer. Although I do wonder what The Space Billionaire is up to now. I like to think they’re out there being an angel investor to somebody else in need, helping someone else trivialize a major portion of this game. Thank you Space Billionaire. I’ll never forget you.